There have been several successful fund raising events for over 10 years to benefit The Ara Parseghian Medical Research Foundation. Many individuals, organizations, and companies have graciously assisted in raising funds for "the fight," and we thank them. Their generosity gives us hope for Jessica's future. 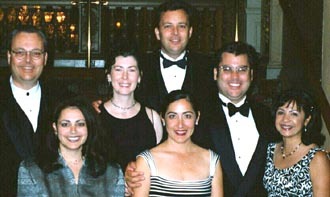 At the 1999 Lambright Gala Affair in Seattle. We presented over $15,000 that we raised. Last: Dad (Anthony) at top. Click on this picture to see it full size! The Community of Westchester commited to the Fight for Jessica when Jessie's pediatric nurse and Dance Teacher sponsored a Heroes Banquet. They raised over $ 5,000. Read about it in the Hometown News. Grandma won a radio sponsored contest from a mortgage company to raise over $3000.00 for the cause. Undergraduate chapters of Pi Kappa Alpha participated in a candy bar drive and raised over $8,000.00. A single chapter sponsored a sorority softball tournament and raised $2,200.00. Another chapter conducted a raffle that raised over $400.00. A businessman wrote appeal letters to his associates that raised over $6,000.00. An old college friend wrote a check for $1,000.00 after hearing about Jessica. An industry association made a donation of $1,000.00 to support the cause. An independent agent from that association wrote his own check for $500.00 after helping to recruit the association donation. A woman celebrated her birthday and asked people to donate to the cause instead of giving a gift. Several hundred dollars were raised. Jessica's Godparents sponsored a Mardi Gras party and raised over $3,000.00. A Las Vegas Night was held and proceeds topped $15,000. 1. You can designate your United Way Payroll Deduction Contribution to APMRF and/or JLMRF. 3. If you are member of a club or organization, adopt our cause for your philanthropy. 4. Next time there's a candy bar drive, you can take a box or five of World's Finest Chocolate to distribute. 5. If you have a business with a point of sale counter, you can place a coin canister near traffic areas to collect donations of change. 7. Sponsor a Tupperware party with proceeds going to the cause. Additional contributions will be gratefully accepted. They can be sent to the Jessica Leoni Trust. 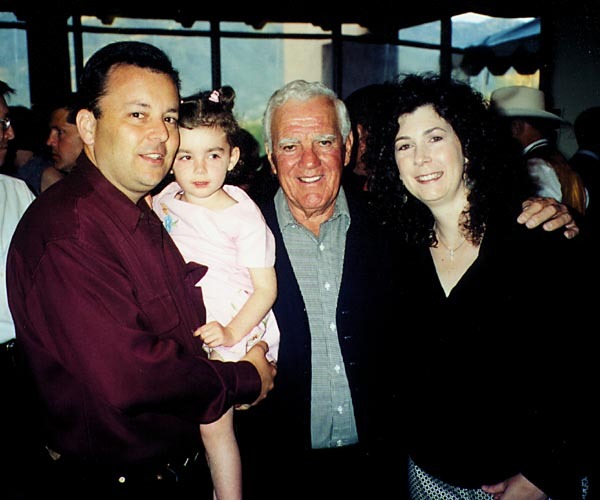 Checks can be made out directly to The Ara Parseghian Medical Research Foundation or The Jim Lambright Medical Research Foundation. Both are non-profit corporations that fund research projects to find a cure for Niemann-Pick Type C Disease. Your donation is tax deductible. Please keep checking this website for information on fund raising events, and please tell your friends about our website.